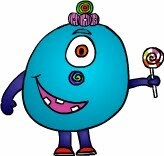 This week's monster drawing lesson is LOLLIPOP! Lollipop loves to eat lollipops and eats one each day. Lollipop owns the town candy store in Murb. She likes to read and go on walks when she is not working at the store. Her best friend is Pickles! Have fun drawing this swirly fun monster! Thanks Kayla C. from Arizona for this fabulous monster! Then you can draw Lollipop. Step 1: Draw Lollipop's face by drawing circles for her eys and nose. Then draw two curved lines for her mouth. Step 2: Draw a large circle for her body. Step 3: Add in an eyebrow and teeth. Step 4: Put 4 circles atop her head for her hair. Step 5: Four lines make up her legs. Step 6: Using a semicircle and straight lines, you can make her shoes. Step 7: Draw one of her arms with two straight lines, a circle and a little U. Step 8: Draw Lollipop's lollipop with a circle and the stick. Step 9: Draw her other arm by making two curved lines and the top of a heart for her hand. Step 10: Add the extra swirls and stripes onto her hair, nose, and lollipop. Hope you enjoy drawing Lollipop! Can't wait to see some of your artwork!